Orwell’s dystopian novel opens in Robert Lepage’s staging of Lorin Maazel’s new opera with the clock tower of Big Ben striking thirteen; the opera ends with the same image, and throughout the work’s 150 minutes running time it often feels as if time has stood still. 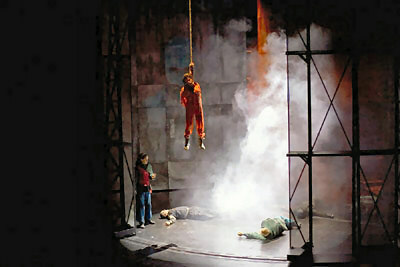 Given Lepage’s own history, as an award-winning filmmaker, it seemed almost inevitable that the Royal Opera House’s staging would lean heavily towards cinema, and there are echoes to filmed versions by Rudolf Cartier (1954), Michael Anderson (1956) and Michael Radford (1984) rippling through it (with more than a nod to Terry Gilliam’s Brazil). Having Jeremy Irons supply the voice over for Big Brother, recounting a sterile shopping list of statistics, more statistics and damned lies, documentary footage relayed on screens and an unambivalent use of videography blurs the distinction between what opera should be and what opera becomes in this confused and disappointing production. With so many distractions on hand (from Piccadilly Circus type message hoards, to eyes staring out at you) opera rarely gets a look in. The capital of Airstrip 1 in Orwell’s novel is London and whilst there is – correctly – not a single hint of the utopian world Oceania would like to believe is the truth, much that could have been done with this production isn’t touched on. Rooted in almost the time the book was written, there is a literalism to the set designs. And yet, London today is probably the single most watched city in the world; a more corrosive look at how Nineteen Eighty Four is of our time might have made for sustainable dramatic tension, rather than the stifling atmosphere that Lepage replicates from cinema with its superficially impressive contour of colours and lighting based around a muted dilapidation of oppression and censorship. There is a 1940s post-war squalor to Carl Fillion’s sets, whether it be in the form of a Charrington’s pub, an empty bedroom or even within the semi-opulence of O’Brien’s room itself. Darkness, piss-soaked walls, rubble littering the streets and the scattered emblems of the past – such as a discarded church bell, against which Julia first seduces Winston – act only as time-specific devices; yet, get to Room 101 itself, and we are in a madhouse of sanitary white and apocalyptic instruments of torture. Orwell’s novel was so ahead of its time that little attempt has been made in this production to tell the story other than it is. And it fails because of that. That is not to say, however, that there are not flickers of genius here and there, almost all of them reserved for the final act. How far cinematography is interlacing with the traditional staging of opera productions could be witnessed in Winston’s hallucinatory rantings about Julia: she appears as a girl dancing through meadows on the vast background screen (an image startlingly reminiscent of the recent Gotterdämmerung at ENO of Siegfried’s Rhine Journey) and similarly well done was Winston’s torture with rats, here seen as a series of rat-like shadows crawling over the walls and floor of his padded cell. These were startling images, evocative even. Winston’s brainwashing is shown in close up shards of agonized facial expressions on a big screen bringing us closer to his torture and pain than might otherwise be the case. But they are isolated inventions within a largely pluralistic and conservative staging. This extends to Lorin Maazel’s score, too. Perhaps because he is principally a conductor, the music is a patchwork of indistinct styles thieved from here and there with little attempt made to give them a uniformity of voice. There are moments – the opening, for example, and Winston’s torture – where the orchestral writing moves up a notch but Maazel’s big failure is to do anything with these innovations, and climaxes fizzle out like smouldering embers. There are some sublime moments during Act II where Maazel accords a theme to a specific instrument – a violin solo, a cello solo, or a percussion solo – and these give the music an edginess that rises above the swamp of pastiche, but the impression is of a composer who does not have a wide enough musical concept to construct long-lasting drama. Strauss (echoes of both Rosenkavalier and Elektra), Britten, Berg, Bernstein and Rodgers and Hammerstein, sit besides Maazel’s own brand of eclecticism. Varese gets a look in with wailing air-raid sirens meshing with the music, sometimes to eerie effect. He does, however, skilfully write for the voice (although an over emphasis on making the libretto rhyme becomes grating), but the lack of any memorable arias makes it a rather pointless exercise, and rather difficult for a critic to write about it in any detail. Despite quite notable differences between what the surtitles were showing and what the singer’s were phrasing (at one stage Simon Keenlyside reversed the order of the lines he was singing) the Royal Opera has assembled a cast which is world-class. Keenlyside’s Winston dominates the opera, and he sings both beautifully and with a profound sense of knowingness. He is beguiling to watch, as consummate an actor as he is a singer. Yet, straight-jacketed by a lack of direction even Keenlyside has problems holding the attention. His ‘love’ scenes with Julia are deliberately uneroticised, stolen moments that end in a Brief Encounter type conclusion. Nancy Gustafson’s Julia is again beautifully sung, but she has too little to do. Richard Margison’s O’Brien is malevolent, but little else. Diana Damrau, in two roles as the Gym Instructress and the Drunken Woman, gives quite wonderful support, but Lawrence Brownlee’s Syme – brilliantly narrating in Newspeak – was both light of voice and tended to use his Rossinian strengths to too little effect. The problem with this new opera is that it is rarely opera at all and in the opera house it works against every construct of what an opera should do. 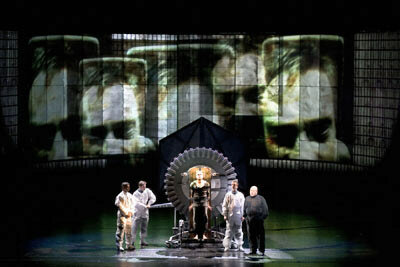 Its trickery is to seduce the eyes rather than the ears; in that sense, 1984 fails lamentably as opera.